True talent can often go unnoticed and unrecognized. One needs to look no further than the various app stores on each mobile platform to see a cornucopia of incredible applications languishing away into obscurity. Talented developers and coders often don’t get the opportunity to show the world their wares. Intel is hoping to change that with the Ultimate Coder Challenge and the opportunity to win $10,000. Throughout the next several weeks, I’ll be serving as a judge for this competition, offering insight, criticism and praise whenever necessary. My wife always told me I could be a bit ‘judgey’ so this should be a perfect fit. The developers are using Intel provided reference design Ultrabooks, meaning these hot lappies won’t be showing up in stores anytime soon. They are spec’d out with the latest Ivy Bridge processors, Windows 8 and augmented by touch and a slew of sensors. If you were holding out for a full review of this rare piece of hardware, it’s best to exhale now, all the internal bits and pieces are safely shielding behind plastic, metal and an iron-clad NDA, but that doesn’t mean there isn’t some uboxing fun to be had. 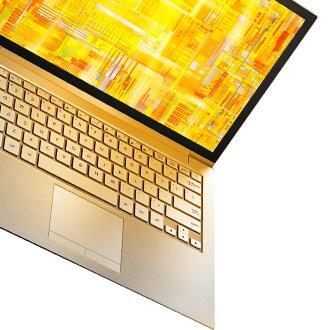 Ultrabooks are changing the way we think about laptops. Sure, the basic idea is the same, there is a screen, a keyboard below it, a trackpad flanked by buttons and a palm rest, but what’s new to the game is touch controls. Windows 8 is the first OS out of Redmond to fully embrace the power of the finger. Using cues from Windows Phone’s (formerly) Metro UI the new homescreen consists series of live tiles that can be controlled via touch. Even more exciting is what developers can do with this new ability. I’m envisioning a new way to interact with games, swiping away e-mails with ease and pinching and zooming my way through applications. So what do the coders have in store for us over the next month or so? Lets go through each. I’m going to reserve judgment on them until I actually get some hands on (get it?) time with each. For more detail on the entries, check out the official blog. Blue Innovations: The duo of George and Suresh will be porting the MoneyBag app to the Ultrabook platform. It’s a pretty elegant way to manage all your finances. They are planning to implement touch in a pretty creative way. Lee Bamber: Bamber decribes his application, ‘Love Hearts’ “an ambitious attempt to combine social messaging and gaming into a single fun and surprising experience. The initial idea came from those crazy 8-balls you shake, resulting in some random fortune cookie style advice to your most pressing questions. What if you could shake your device and a game would pop up or a piece of a puzzle, or a tool to create new things with. Naturally the idea was not fully formed, and asking users to pick up and shake their Ultrabooks would not win me any favours. Even so, the initial idea grew into an app design that would encourage creativity, sharing and fun, whilst at the same time tapping into the unique features of the Ultrabook.” While the idea of physically shaking an Ultrabook is a bit unnerving and awkward to me, I am curios to see how this plays out. BioIQ: Aimed at the High School education market, BioIQ by Clef Software is a port of a game already available on iOS and Android. It’s described as “… a picture puzzle game. It presents pictures of biology related subjects (such as plant cell, human heart and dissection of frog) and requires the player to label parts of the picture from a choice of labels. “ I really like the education angle, but I’m curious how a mobile port will play on the larger, less forgiving Ultrabook screen. Althea Systems: The makers of the popular social video discovery app Shufflr are back to bring their million user strong application to the Ultrabook. They are already building on an incredibly successful product, so I expect the transition from mobile to desktop will a breeze for these professionals. Andreas Breitschopp: Have you ever been stranded in a foreign county were you did not speak their language? Andreas hopes he has the solution to your problem with his vocabulary trainer. He essentially makes a game out of language to aid in the learning process. This one, if executed properly, could be a potential game changer in the language business. It’s obviously too early to really to start the judging process, but each submission does look promising. Are you looking forward to one in particular? Hit us down below to give us your thoughts. Full disclosure – We are being compensated for advertising related to the Ultimate Coder Ultrabook Challenge and to attend an Intel event. We have commited to posting at least once per week on this subject and judging the final applications. All posts are 100% written and edited by TechnoBuffalo.